on our FaceBook Page starting from today. 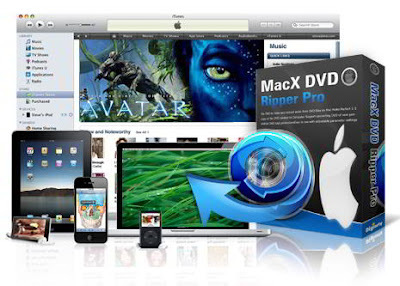 MacX DVD Ripper Pro for Windows is fastest DVD ripper to backup DVD to hard drive or USB, rip DVD for iPhone, iPod, iPad/iPad 2, with original quality. It is an innovative DVD ripping tool to backup DVD to hard drive while preserving original quality and rip DVD movies into different video formats. It accepts a myriad of video formats such as FLV, AVI, MP4, WMV, MOV, MPEG as output formats, as well as the ability of ripping DVD straight to iPhone, iPod, iPad/iPad 2, PSP, Apple TV, Zune, Zen, etc with stunning speed. This DVD ripper software gives you full access to protected DVD movies by getting rid of the copy protections. It strips CSS encryption, Sony ARccOS encryption, RCE Region protection, Disney X-project DRM, etc. Powered with NVIDIA® CUDA™, it prompt DVD movies conversion, up to 5X faster in conversion time. Many thanks to Digiarty Software! does the same key work for both the ripper and the converter? I see, I wrote a support ticket up. As soon I got answer I will answer. The download links was wrong in the source code. I got now a new html code from Digiarty and fixed it. Please check the Facebook site again. I'm very sorry for the error.